There are lots of advantages of installing a dictionary app on your PC. There are both online, and offline dictionaries and some of them also support multiple languages. Advanced dictionary software also support translation tasks, not only clear definitions of words. Having an online dictionary with you at all times is a great convenience. Google’s ‘define’ search feature is probably one of the quickest and the most convenient ways to look up a word, but it is only beneficial when you have an Internet connection at your disposal. Fortunately, there are plenty of apps that allow you to look up definitions even when you are offline. This sort of apps will improve your work efficiency and flow to the maximum point. There are lots of dictionary apps that are considered 100% accurate. This means that there will be no inappropriate results for any words that users insert into the apps. On the other hand, some apps will often mistranslate certain words. When you need to find the exact meaning of a particular word, a dictionary tools comes in very handy. Today, these tools can be used for online purposes, but also when you’re offline. Once you downloaded and installed the dictionary software, you will always find the words that you want without having to connect to the Internet. Some dictionary apps also offer example sentences or extra content, such as grammar, tips, phrases, idioms, slang dictionary and more. There are also dictionary apps that support text to speech if you are not really sure how to pronounce a particular word the right way. Dictionary apps are also useful for people who are trying to acquire new vocabulary skills, or for English language students. 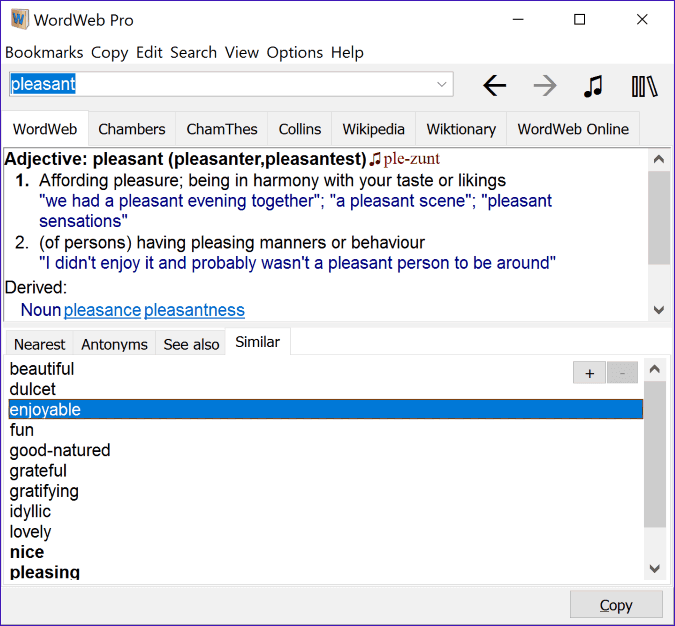 Here are five of the best and of the most useful dictionary software that you can easily download and use on your Windows 10 PC. – create flashcard to memorize vocabulary lists, verb forms, etc. You can try it for free from the official webpage as it has a full trial for 10 days. By using it, you will browse through 85000 entries, more than 300000 definitions and 65000 synonyms. 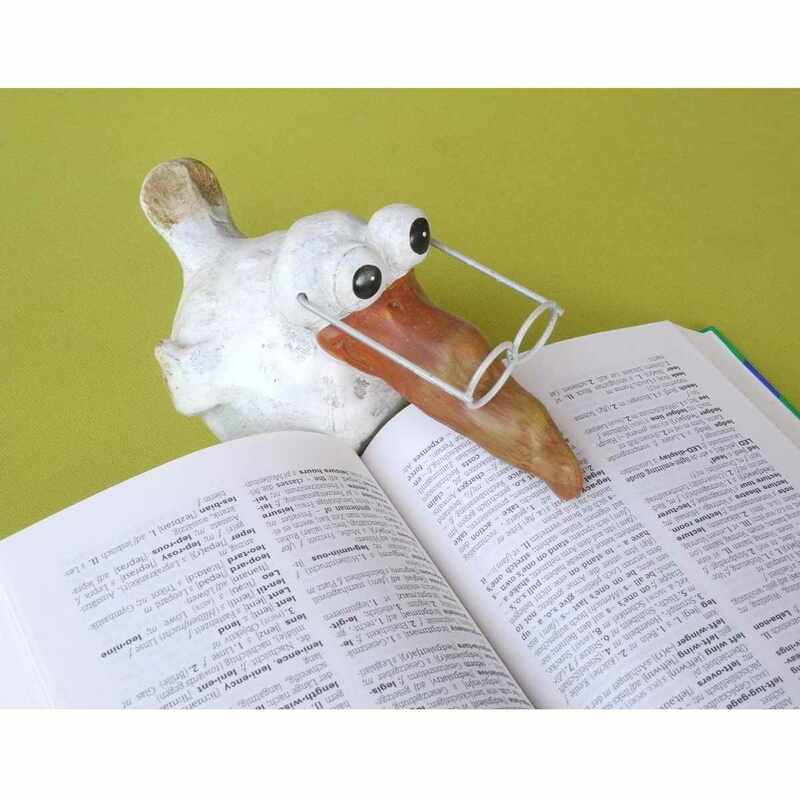 The dictionary also gives you the possibility to surf through example phrases, idioms, and expressions according to geographic specificities. Try this tool and let us know in the comment section if this is a must-have dictionary. 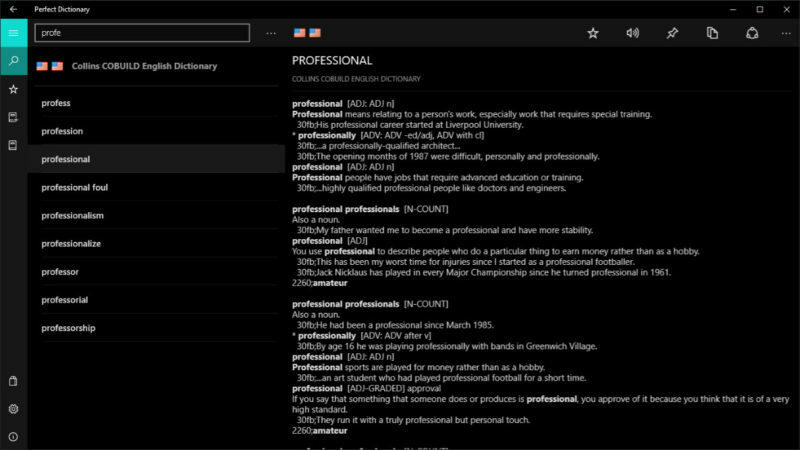 This tool promises to be the world’s most comprehensive dictionary. Using it, you can search multiple English dictionaries, and you will be able to find various extensive definitions, audio and phonetic pronunciations, etymologies, usage sentences and much more. This is also an Offline English dictionary and thesaurus, but you must be aware of the fact that the offline content must be downloaded separately using an Internet connection before the offline mode will be available for access. With this tool, you can get in-depth info from specialty dictionaries such as legal, medical, acronyms, financial, idioms and even Wikipedia. You will be able to quickly and easily toggle between them by using the source icons. You can access dictionaries in 13 more languages including French, Spanish, Italian, German, Portuguese, Chinese, Norwegian, Dutch, Arabic, Greek, Polish, Turkish, and Russian. You are able to translate English words into over 40 languages that range from Afrikaans and Arabic to Urdu and Vietnamese and dozens of other translation options. Using this tool you will be able to learn something new every day thanks to the fresh daily content including the following: Word of the Day, The Day in History, Idiom of the Day, Quote of the Day, and much more. You can browse multiple thesaurus sources, featuring synonyms, antonyms, related words, and also pictures. You will get the opportunity of using Advanced Search options including “Starts with,” “Ends with” and more. The app lets you share your favorite words and articles via email and social networking websites such as Twitter and Facebook. The app’s interface is multilingual, and you can navigate it in a dozen languages. You can also log in to sync your bookmarks and to track your learning. The tool allows you to play games in multiple languages when you’re bored. You can customize your homepage including personalized Horoscope, local Weather and more. It lets you add unlimited bookmarks, jump to Definitions, Translations, and Thesaurus with just one button. You have the ability to look up the definition of any word on the page with the highlight feature, and you can also create tiles for homepage content like Word of the Day and much more. You can view the recent search history and remove all ads with the help of the Ad-free Upgrade option. This is a comprehensive English dictionary and thesaurus that offers users various useful and in some cases a few unusual search tools. This project is rooted in research, and this tool is a research instrument. The developers are linguists with many interests in the field. Among these interests are word knowledge and also vocabulary acquisition. The tool’s developers have first created this project to serve their own investigative concerns. Their colleagues then asked for copies, and this is the way that the whole thing started. Eventually, they were contacted by complete strangers, and the initial public release of the tool is over a decade old. The software inherited its core wide-ranging scope from Princeton’s George Armitage Miller WordNet of which it has already become a branch. The tool has continually grown by leaps and bounds following its own path and becoming different from its progenitor in most ways. The scope of this dictionary is that of English as an international language. The software contains entries from dialects from all over the world including their variant senses and spelling. The definitions of the words are written using the American English for more consistency. The requests and the ports have consistently increased over the years, and this was a natural consequence of the fragmentation of the operating system landscape brought by the mobile revolution. Another great thing about this tool is that it is provided for free as it always has been. Most English language lovers and also casual users appreciate the value of this project and everyone supports its continuing development on Windows and more platforms. The Sage consists of two different systems including a multi-tool interface and a knowledge database. The knowledge database consists of a tightly integrated English dictionary and thesaurus. TheSage’s index contains more than 250,000 words and its dictionary has approximately 315,000 senses, 69,000 etymologies, 55,000 examples of use, and 75,000 phonetic transcriptions. 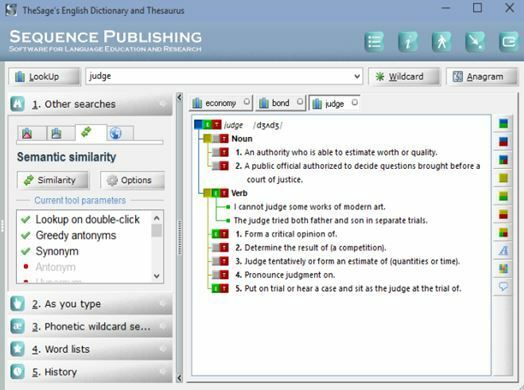 TheSage’s thesaurus includes approximately 1,850,000 relationships between words and definitions, from synonyms and antonyms to hypernyms, hyponyms, meronyms, holonyms, etc. The interface allows you to extract and collect data from the knowledge database in a variety of ways. This is accomplished with the tools shown in the left Navigation panel. The software was created to be used by all kinds of language researchers and pedagogues seeking to carry out certain linguistic analyses. This is a free offline dictionary for Windows, and it contains a German – English dictionary and more dictionaries including Spanish, French, Italian, Japanese, Chinese, Kurdish, Turkish, Arabic and Norwegian. You can also import your own wordlists, and you can then use them in parallel with the already existing dictionaries. For each dictionary, there is a user dictionary that can be defined to include additional wordlists. You don’t have to pay anything for this tool, as it is free of cost. It offers you the possibility to search for the beginning, the ending and the middle part of a particular word and you can also find collocations. The activation is possible with a customizable HotKey, and this offers automatic search for a tagged word or a word from the clipboard. The software also provides a list of your latest searches and the possibility to download on a memory stick. You can use the tool when you are offline as well, and it gives you the opportunity to transcript phonetically many English words. The user interface is in German and in English, and you have direct links to look up words in Wikipedia and lots of search engines. LingoPad is a software that takes up less storage than many software in the section Science & education software. It’s a program very heavily used in United States, Indonesia, and Cameroon. The software can look up words in virtually any program with just one click, and all you have to do is hold down the Ctrl-key and right click on the word. In case you are online, with one extra click you can also search web references such as Wikipedia, for instance. The hotkey can be customized, or you can also use a keyboard shortcut. In case you are ending a document, you can also select a synonym and replace the look-up word. WrodWeb features the option to highlight the widely used synonyms, and this is perfect for helping you write a correct and clear easy-to-understand English. In case you are looking for a particular part of speech, you can click on the Verb, Noun, Adjective or Adverb buttons to show only the relevant synonyms and the related words. To look at a particular sense you can click on the sense number. Browsing around the related words is very simple, and all you have to do is click on the tabs for synonyms and antonyms, parts, anagrams and so on. In case you want to see the definition for one of the related words, just double-click on that particular word, you can also use the back and forward buttons. Related words also have the – and + buttons so that they can be more or less specific. For instance, in case you look at the similar words, maybe you’d like to see words that are more loosely related. You will be able to do exactly this by pressing the + button. More than using the comprehensive English dictionary and thesaurus supplied by this cool tool, in case you are online, you can also search your choice of web references. Every reference is on a separate tabbed page for easy cross-referencing. The list of tabs can be customized to use your favorite references. You should know that Wikipedia. Some online dictionaries are installed by default. 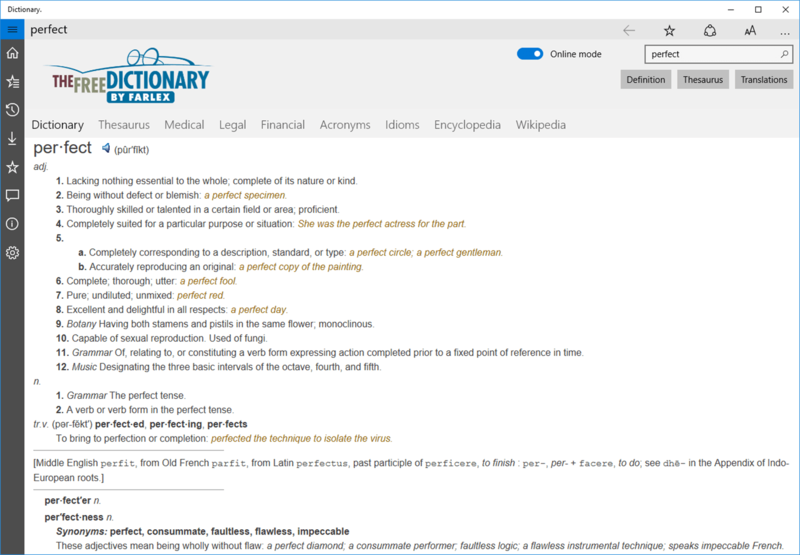 You also have the option of getting third-party dictionaries including the Oxford Chamber and Collins dictionaries, and they will be shown on separate tabs like the web references. This is one of the most comprehensive offline dictionaries on the Windows Phone. You can search multiple dictionaries from a massive database in over 50 languages. 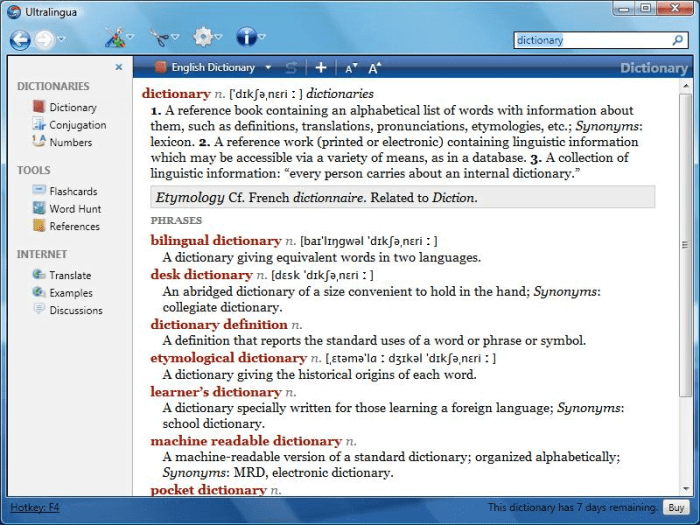 The tool features automatic word suggestions such as enabling dictionaries while typing. It also offers you the ability to see the history of your previously searched words and to remove the history any time you want to. You can choose to mark words as Favorite and pin them to start screen. You can play audio pronunciations of words. When you first launch the app, your first order of business will be to select a dictionary to use in your translations or your searches. You just have to tap on the download button to dive deeper into things and to pick your language. The tool supports more than 50 languages that can be translated from or to. Each language may feature various dictionaries to choose from, and dictionary download sizes typically are in the neighborhood of one to 50 MB. You will be able to download as many dictionaries as your Windows Phone storage will allow and as you search for a word, the entire dictionary database that was downloaded will be scanned. The tool also offers you the option to install dictionaries from your microSD card. Once you downloaded a dictionary database, the Perfect Dictionary’s interface will turn out to be as straightforward as possible. At the top of the main page, you will find a word search field that will help you find the word that you are looking for. As you type, automatic suggestions will appear beneath every dictionary heading, and after you see the word that you are looking for, you have to tap it for translation. In case the dictionary doesn’t have the translation for the particular word that you are looking for, it will just not be displayed. All five dictionary apps that we have presented so far are compatible with systems running Windows 10. Editor’s Note: This post was originally published in July 2017 and has been since revamped and updated for freshness, accuracy, and comprehensiveness.